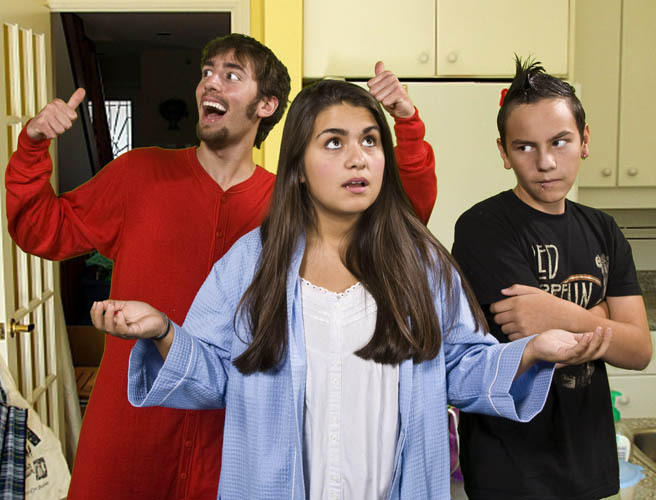 The Munster Theatre Company of Munster High School is pleased to present its first production of the season, the comedy, Fuddy Mirrors by David Lindsay-Abaire. 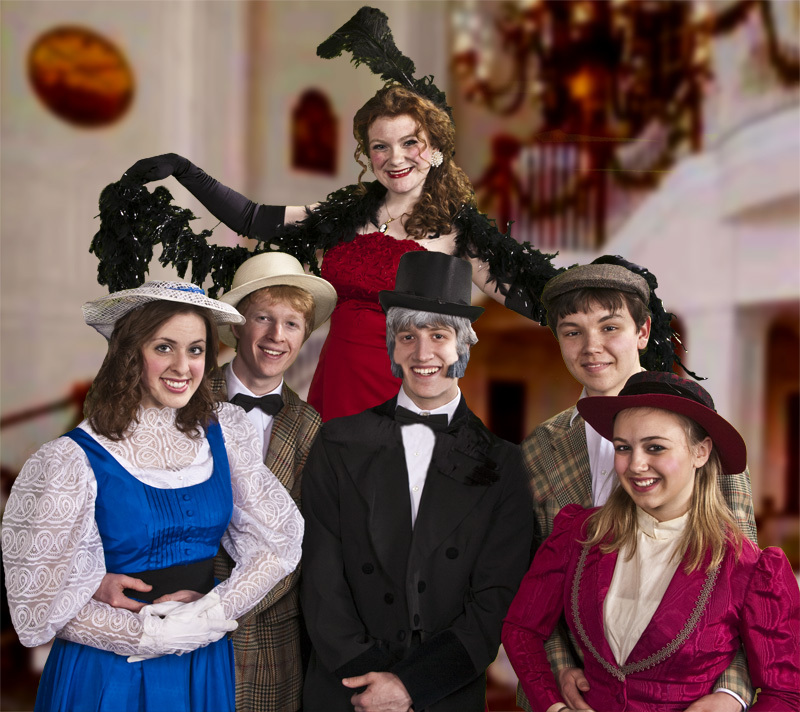 Produced by Larry A Brechner, this full-length, student directed production will feature Munster High School seniors, Katie Taylor as the show’s director, assisted by Eric Etter. 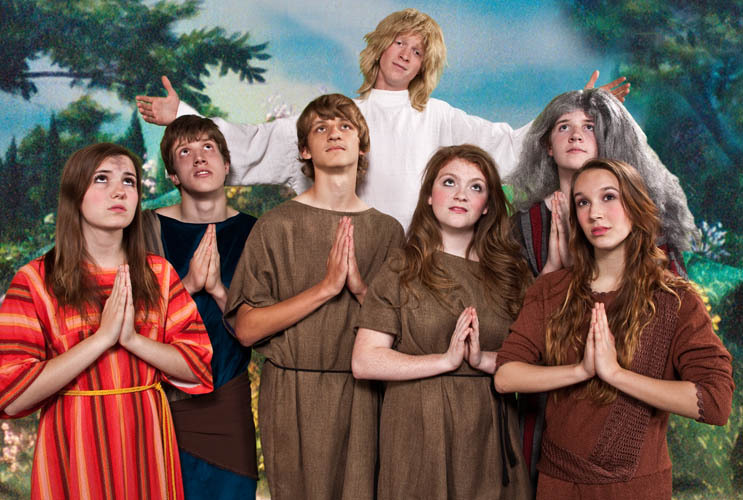 The Novice production features the talents of over eighteen new freshman and sophomore actors (or juniors or seniors who have never been on stage before). 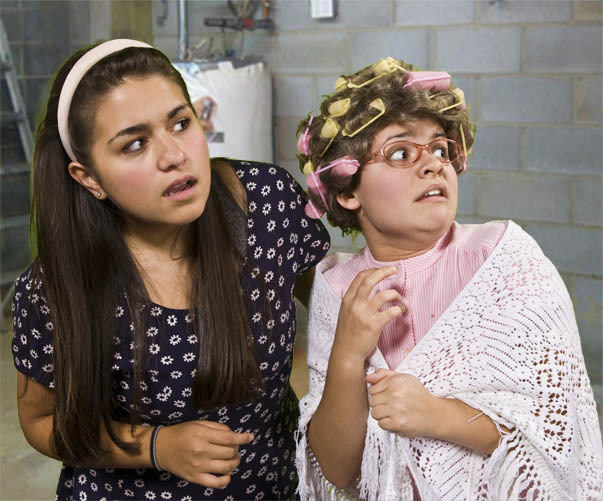 Fuddy Mirrors will run Tuesday & Wednesday, September 21 & 22 at 7pm in the Munster Auditorium. Tickets are $5 at the door and are available at the Auditorium Box Office on performance nights or by calling: (219) 836-3200 x3245 or my email apkinser@munaud.org. It tells the story of an amnesiac, Claire (Tonia Cordova), who awakens each morning as a blank slate on which her husband, Richard (Ben Nichols) and teenage son, Kenny (Harry Goldenberg) must imprint the facts of her life. One morning Claire is abducted by a limping, lisping man, Zach (Tariq Collins), who claims her husband wants to kill her. He takes Claire to her mother, Gertie (Rachel Borgo) who suffers from aphasia and is unable to speak clearly. They meet Millet (Tyler Reinsma), a kind man with an apparent mental disability and often speaks using a puppet. Meantime Heidi (Kendall Goldberg), posing as a police officer, attempts to stop Richard and Kenny from reaching Claire. The audience views the ensuing mayhem through the kaleidoscope of Claire's world. The play culminates in a cacophony of revelations, proving that everything is not what it appears to be. The play's title "Fuddy Meers" is Gertie's attempt to pronounce the phrase "funhouse mirrors". 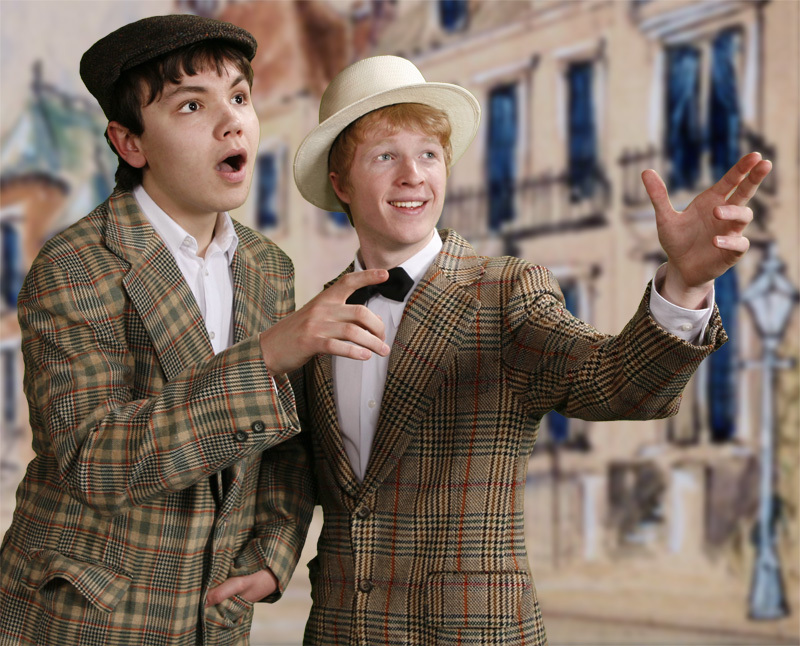 Fuddy Meers will run Tuesday & Wednesday, September 21 & 22 at 7pm in the Munster Auditorium. Tickets are $5 at the door are available at the Auditorium Box Office on performance nights or by calling: (219) 836-3200 x3245 or my email MunAud Box Office. A hilarious situation comedy about careers in Hollywood. Three teenage girls hit Hollywood, each full of dreams about being discovered -- one, a screenwriter; the second, a director; and the third, an actress. But their limited funds land then in a grungy bungalow court replete with assorted Hollywood characters: a tyrannical landlady, a has-been film actress, a teenage beauty queen, punk-rockers, a graffiti artist, etc. Many hilarious survival situations as they make the first successful steps toward their chosen careers. 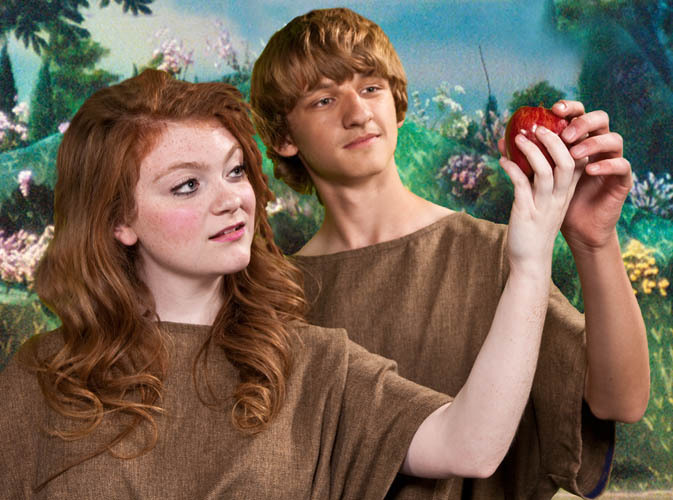 Children of Eden begins at the beginning. The show opens with Father (Jonathan Wachala) seeking to "Let There Be" a universe complete with plants and animals. Not satisfied, he creates Adam (Michael Peters) and Eve (Katie Taylor), and tells them they have only to be good and grateful children. Adam assures Father that he will be "Good". Adam and Eve eventually eat of the Tree of Knowledge and are tossed out of the garden. They continue life in "The Wasteland" where their sons Cain (Chris Yothment) and Abel (Lester Blumberg) are born. Years, later, Eve recants to Father how Adam never stopped looking for Cain, but how life has moved on with their new son Seth (Ryan Pohrte). Eve then joins Father in heaven leaving the earth to the "Children of Eden"
Act II of Children of Eden opens with a tour of the "Generations" from Adam through Noah (Steven Caraher). Following the tour, Noah speaks to Father about reconsidering his decision to flood the earth. When Father refuses, Noah continues the preparations, including seeking the right wife for his son Japheth. 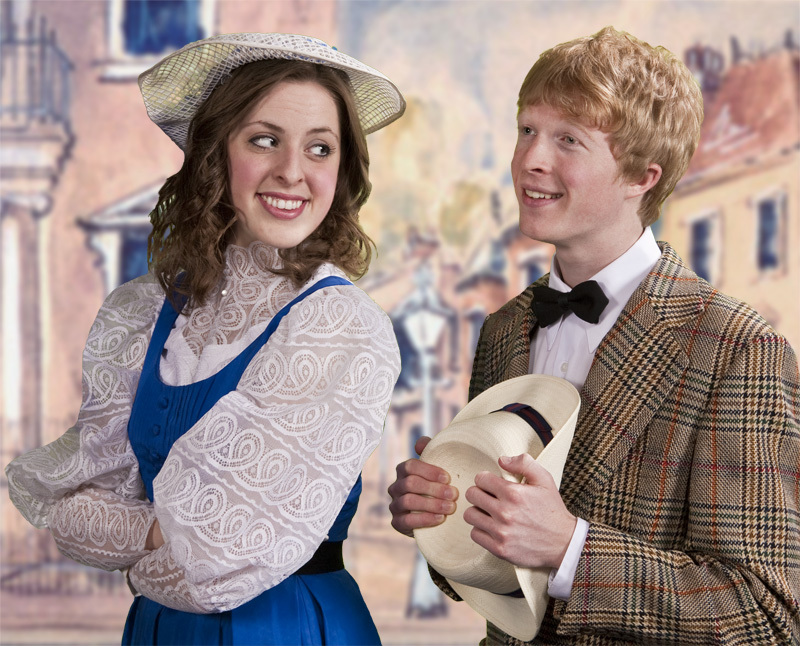 Japheth (Nick Estes), though knowing his wife should be of the race of Seth, falls in love with Yonah (Natalie Vick), the family servant girl who wears the mark of Cain. All chaos breaks out shortly after he announces his decision to the family. Yonah bravely expresses her fate being from the race of Cain and to face the coming flood with "No Stranger to the Rain". 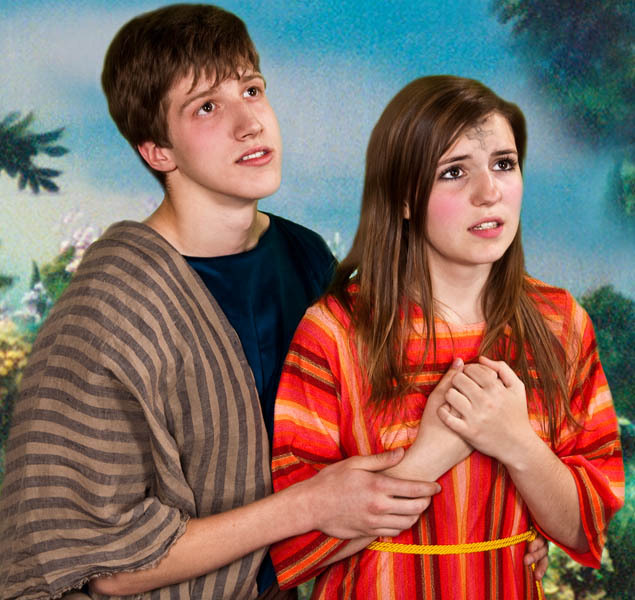 Japheth & Yonah pledge their love in "Whatever Time We Have"
Fearing the flood, Japheth persuades Yonah to stow away on the Ark. After "Forty Days and Forty Nights" come and go, the family discovers her. 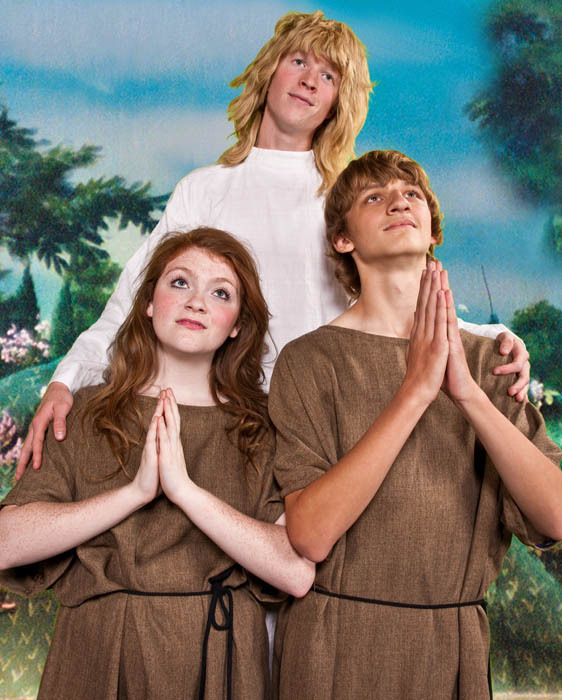 Noah, going against a clear order from Father, allows Yonah to remain and marries her and Japheth. Shortly after the wedding, the rain ends and a dove appears with an olive branch. Mama Noah (Alexa Johnson) sings of how good it is to see the sun again. The family disembarks and sets about to rebuild the world with the next generation of the Children of Eden. 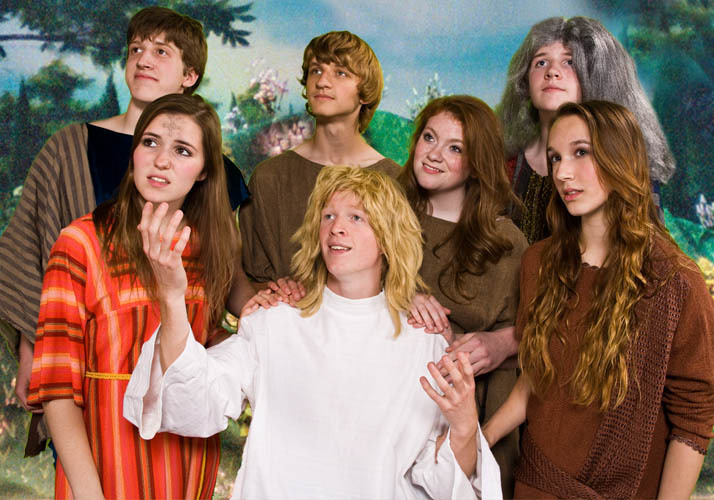 The Munster Theatre Company musical production of, Children of Eden will feature an ensemble of cast MTC veterans and newcomers in its version including: Jessica Banaszak, Rachel Borgo, Katie Kajewski, Kendall Goldberg, Micahrel Han, Helena Jancosek, Rebecca Karnezis, Colleen Kifer, Megan Miller, Brenda Mintz, Josh Roman, Levi Sauak, Samantha Strimmel, and Tim Wittkamp. 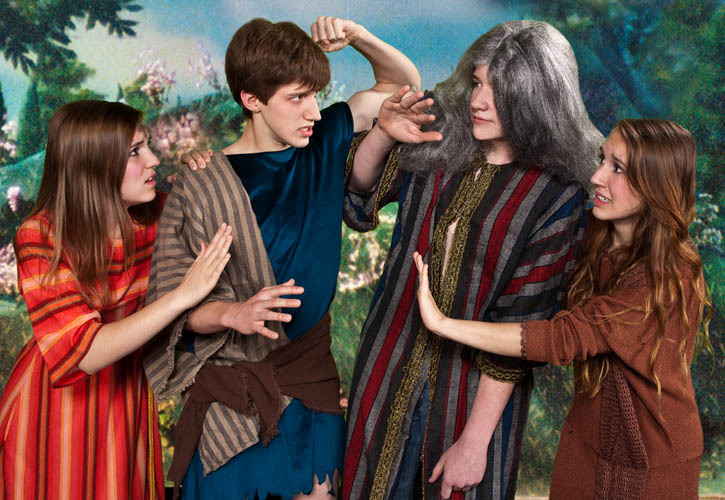 The Munster Theatre Company (the Performing Arts Department of Munster High School) is pleased to present the Stephen Schwartz musical, Children of Eden. Schwartz is best know for the musicals of Pippin, Godspell, Wicked, and many others on stage and film. 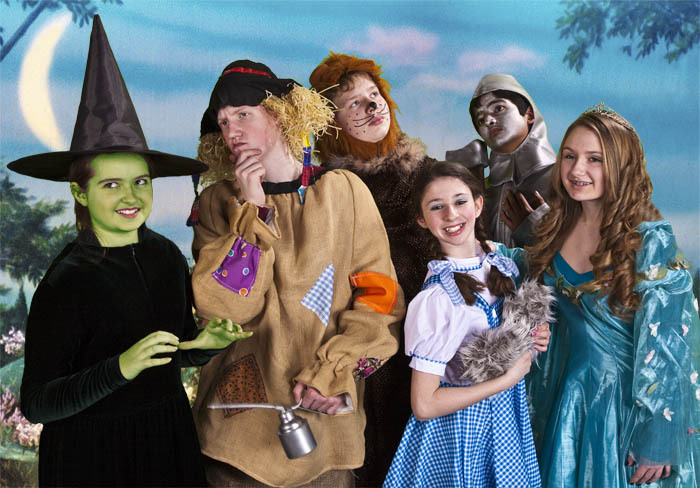 The Production and Directing Staff include: Dr. Larry A Brechner, Producer/Director; William Woods Music/Orchestra Director; Carol Lynn Brechner, Assistant Director; Haley Conger, Student Director and Alexa Johnson, Student Choreographer. 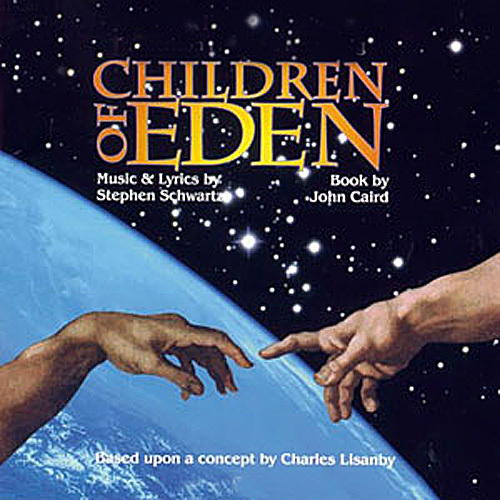 Featuring music from Wicked / Godspell / Pippin composer Stephen Schwartz, with a book by John Caird, Children of Eden will enchant audiences. It run Thursday, November 18; Friday, November 19; Saturday, November 20 at 7pm, and Sunday, November 21 at 2pm in Munster Auditorium. Adult tickets are $7 (senior and student tickets $5). 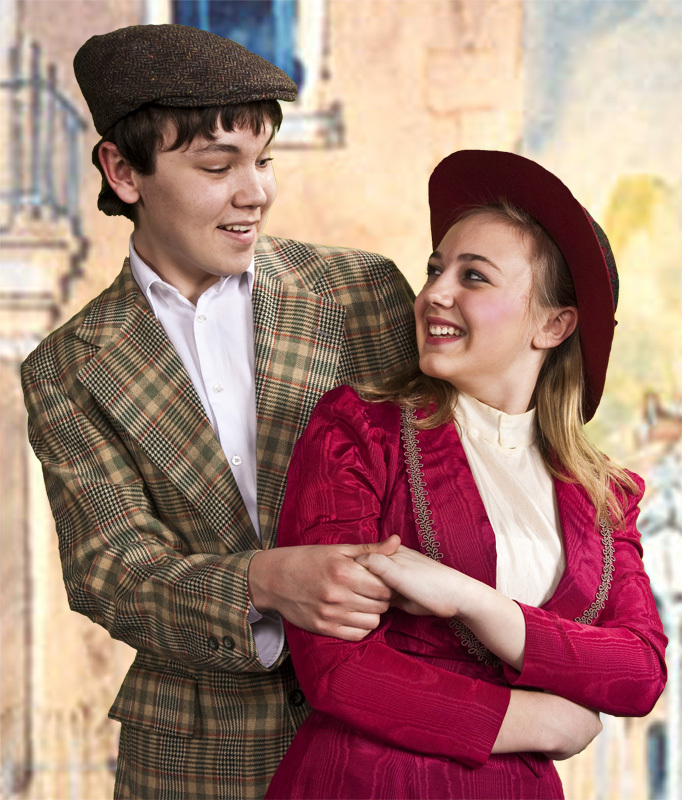 Tickets are available at the Auditorium Box Office on performance nights or in advance by calling: (219) 836-3200 x3245, by email at MunAud Box Office. Produced by Dr. Larry A Brechner, this full-length, student-directed production will feature the solo directing debut of Josh Bobeck & Ryan Pohrte assisted by Samantha Adler. We all know that the real drama in a theatre takes place backstage and creates quite a comedy to watch! 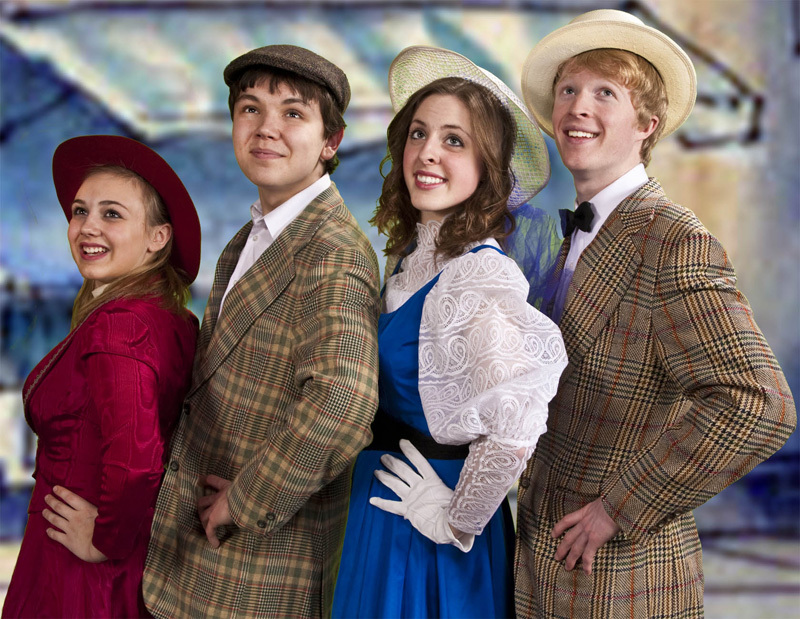 Once it is discovered that Cavendish has passed away, Lou (Haley Conger), the director, assembles her production staff including, Max (Megan Miller), her stage manager and Goose (Michael Caraher), her lighting designer as to what to do with this dilemma. 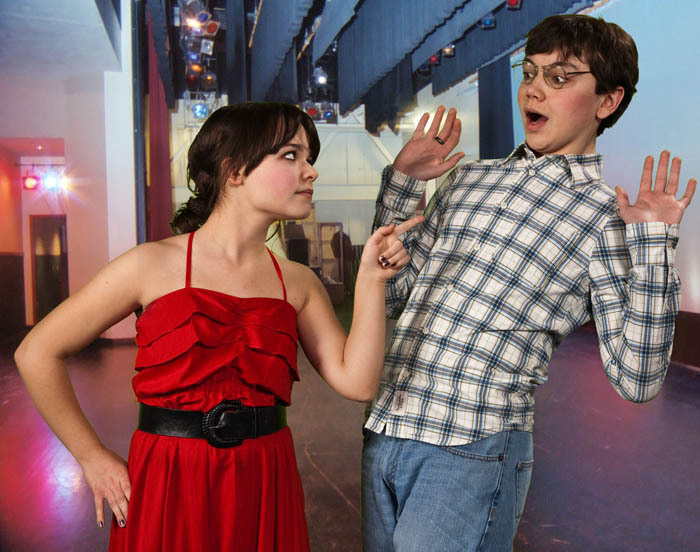 Lou calls on Ajax (Christian Fary), the understudy, to fill in who is whipped into shape by Polly (Rachel Borgo), the Assistant Director, who has a more than causal interest in him. He reluctantly agrees, only to face nasty critics, doting mothers and one very large goon sent to collect a bundle from the great actor. 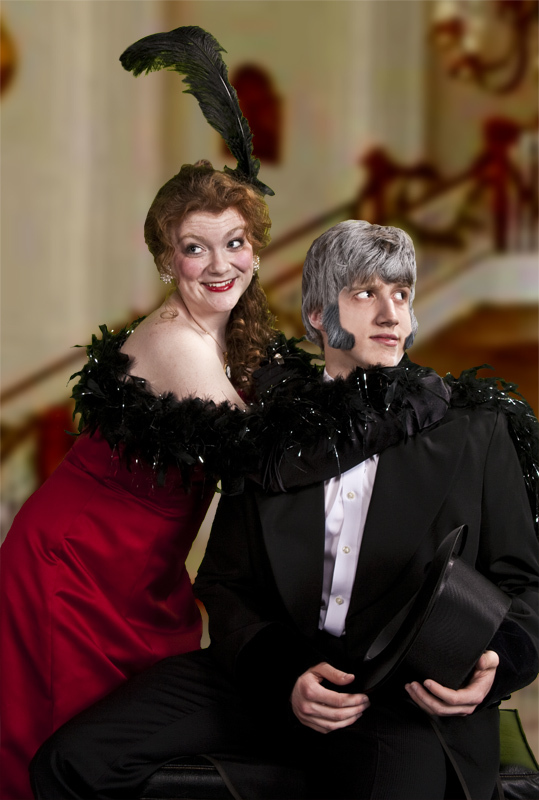 Lines and plot twists fly as fast as you’ll sell tickets in this theatrical farce where over-the-hill prima donnas reign — or think they do — and most of the rest of the cast is betting on who comes out on top. Dolly goes to visit Horace Vandergelder at his hay and feed store in Yonkers. While there she arranges for his niece, Ermengarde and her suitor, Ambrose Kemper to come with her to New York City to prove to her disapproving uncle that she is ready to marry. 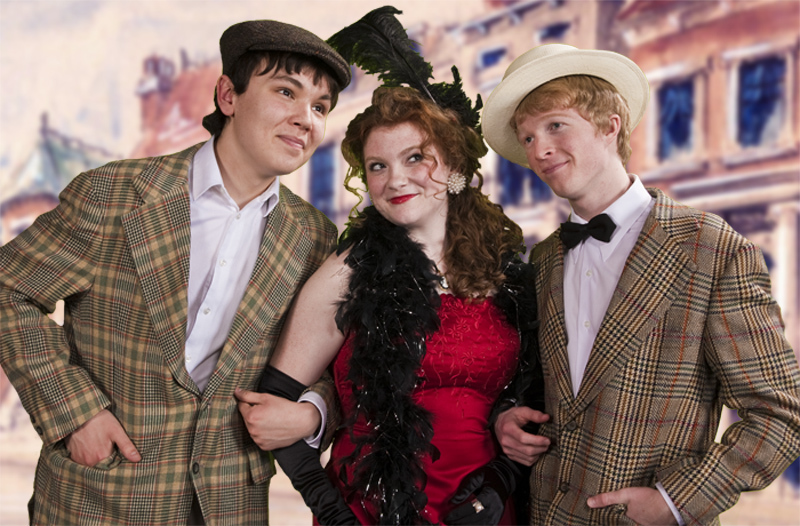 Dolly also encourages Cornelius and Barnaby to go to New York for an adventure. Cornelius and Barnaby close the store and plan their adventure in "Put On Your Sunday Clothes" and leave for New York. Dolly suggests to Cornelius that he might pay a visit to Irene Malloy at her ladies hat shop. 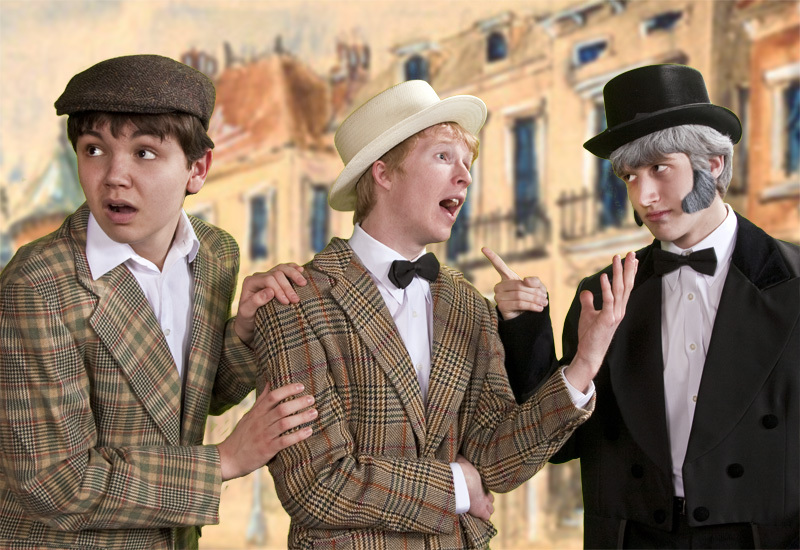 After Vandergelder storms out of the hat shop, Dolly teaches Cornelius and Barnaby how to dance then arranges for the foursome to go to dinner. Out into the streets of the city, they are all caught up in the great Fourteenth Street Association Parade. Later, Dolly is greeted by the waiters, cooks, doormen and wine stewards at the Harmonia Gardens in one of the most famous songs in the history of American musical theater, Hello, Dolly! Vandergelder discovers his two clerks have left the store in Yonkers for a night on the town in New York and promptly fires both of them. After a police raid where everyone is brought before a judge, only Vandergelder is jailed as Dolly tells him in song, “So Long Dearie,” about leaving him alone. In the end Dolly quotes her late husband as she says, "Money, pardon the expression, is like manure. It's not worth a thing unless it's spread around encouraging young things to grow."